would you like your pen pot personalised (square style pen pot only)? would you like your pen pot personalised (square style pen pot only)? (required)No, plain pen pot.Yes, Personalise. I accept this is a non-refundable order & add up to 2 working days to my chosen delivery service. would you like your pen pot personalised (square style pen pot only)? (required)No, plain pen pot.Yes, Personalise. I accept this is a non-refundable order & add up to 2 working days to my chosen delivery service. would you like your pen pot personalised (square style pen pot only)? (required)No, plain pen pot.Yes, Personalise. I accept this is a non-refundable order & add up to 2 working days to my chosen delivery service. would you like your pen pot personalised (square style pen pot only)? (required)No, plain pen pot.Yes, Personalise. I accept this is a non-refundable order & add up to 2 working days to my chosen delivery service. 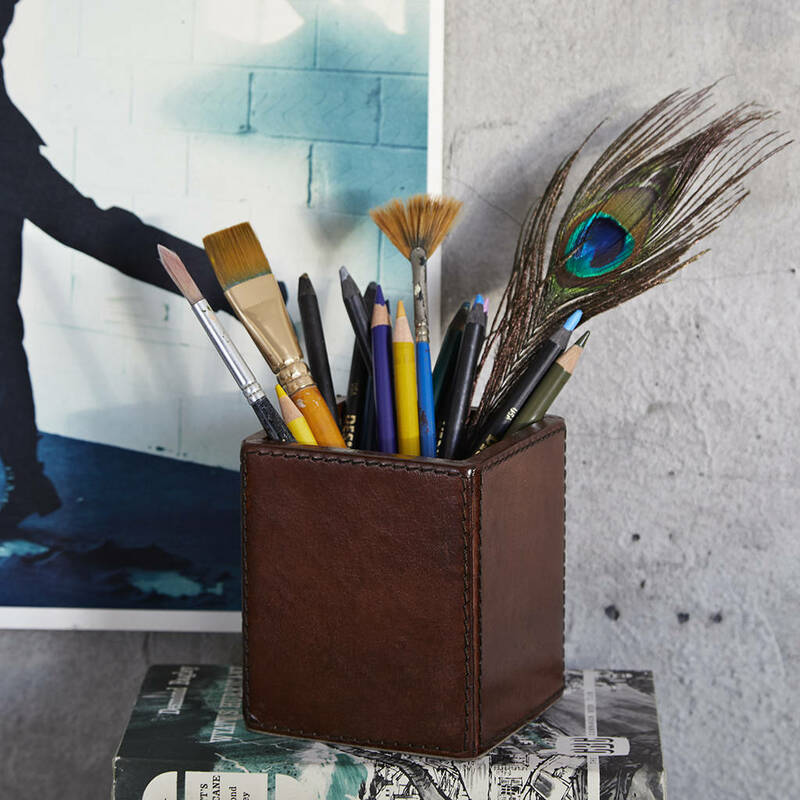 A smart leather pen pot, essential for tidying your desk space. We can personalise the square pen pots. Place all of your writing equipment in Life of Riley’s beautifully-crafted pen pot. 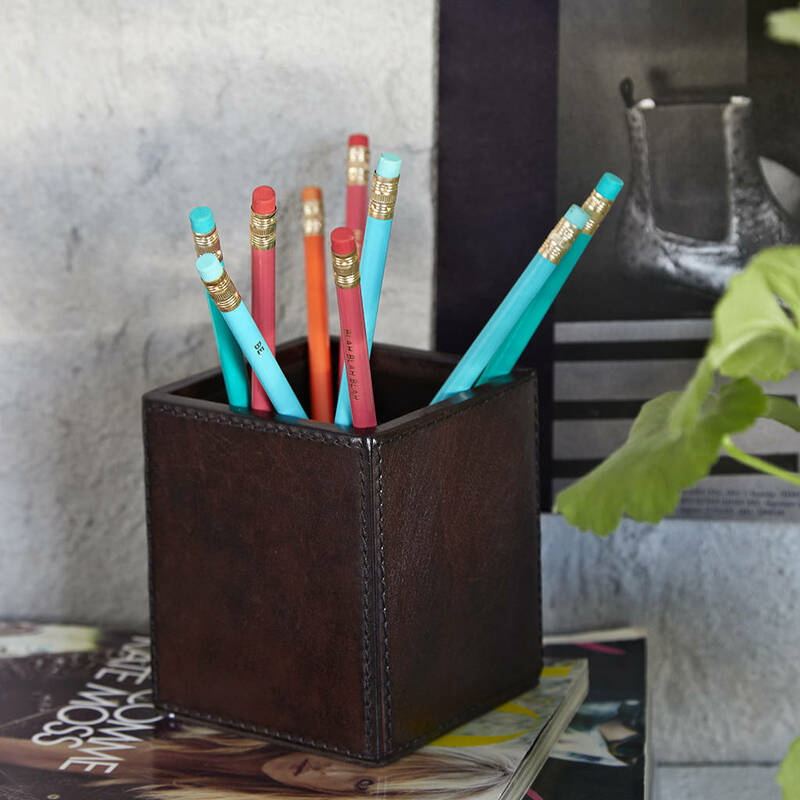 Despite the digital age everyone has a stash of pens and pencils somewhere on their desk and keeping them in order just got stylish. The box is lined in faux suede and the outer is hand antiqued buffalo hide. 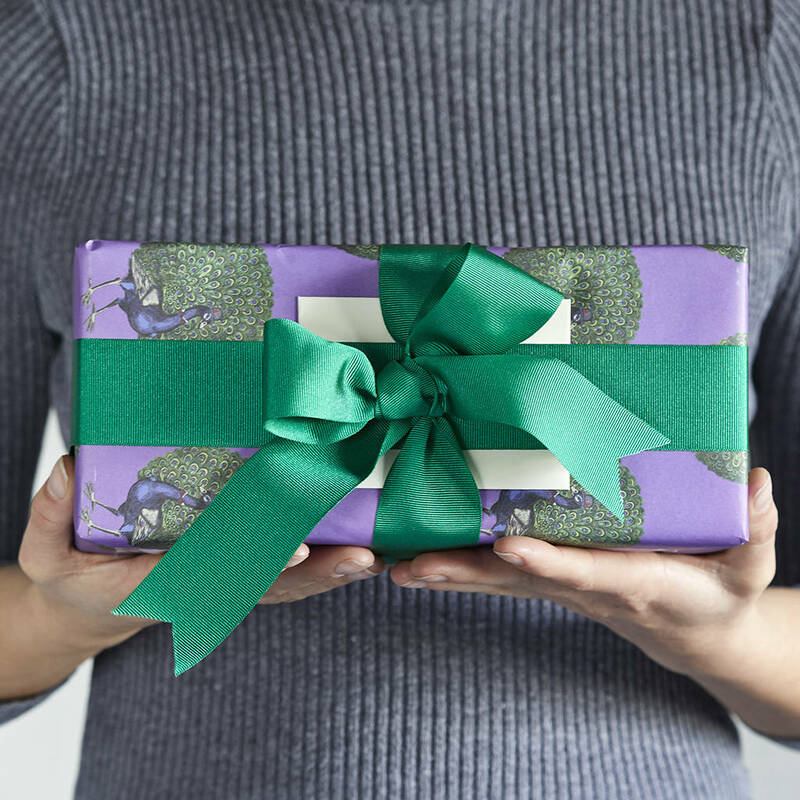 An attractive gift suitable for a keen writer or to celebrate a third wedding anniversary. 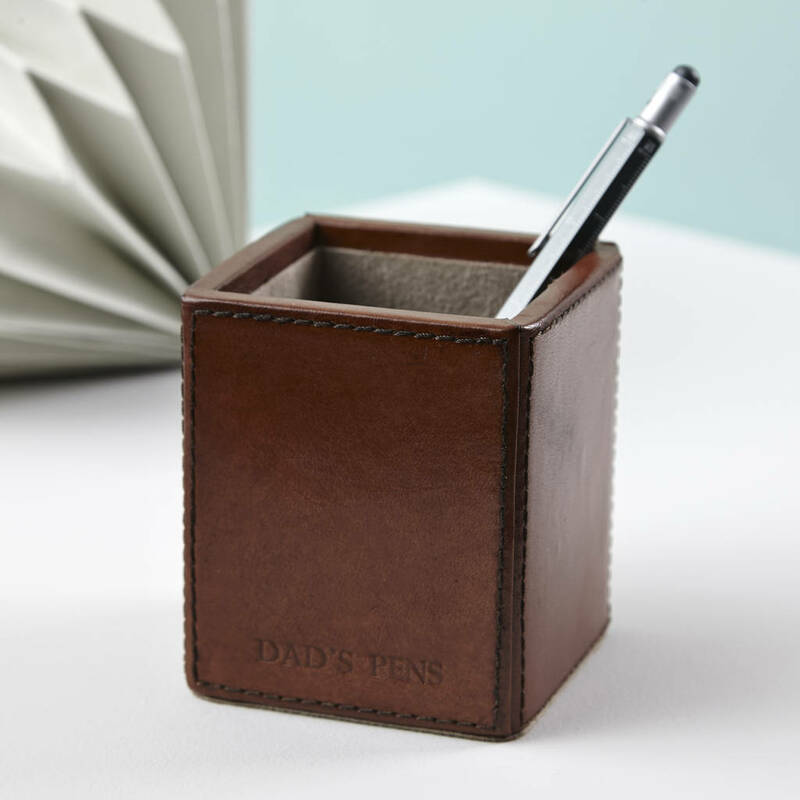 This pen pot matches our other desk accessories to give your desktop a luxurious look. Available in conker brown and dark brown leather. Suitable for embossing. Please note the maximum number of characters is 9 in Upper case or 12 in mixed case. 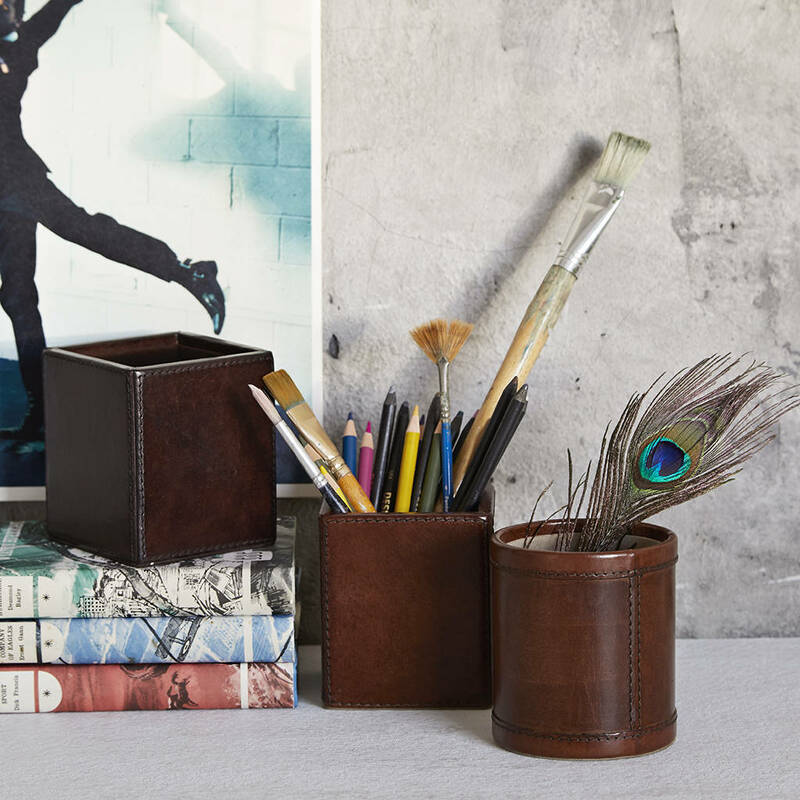 Please be aware this pen pot is made from natural buffalo hide leather and is hand crafted, as such there will be slight variations in colour, texture and markings which we believe adds to the item's beauty and individual character.